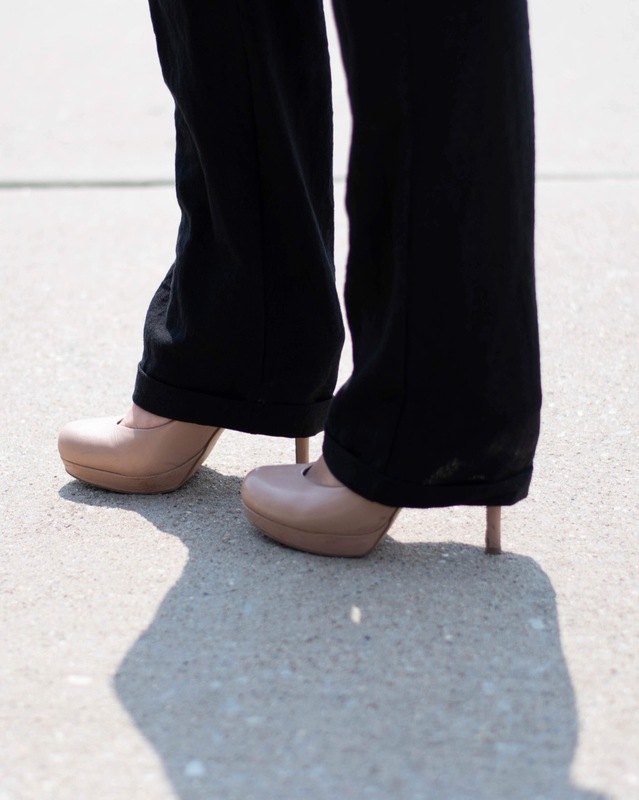 Alright – July was PANTS month in the land of Sew My Style! 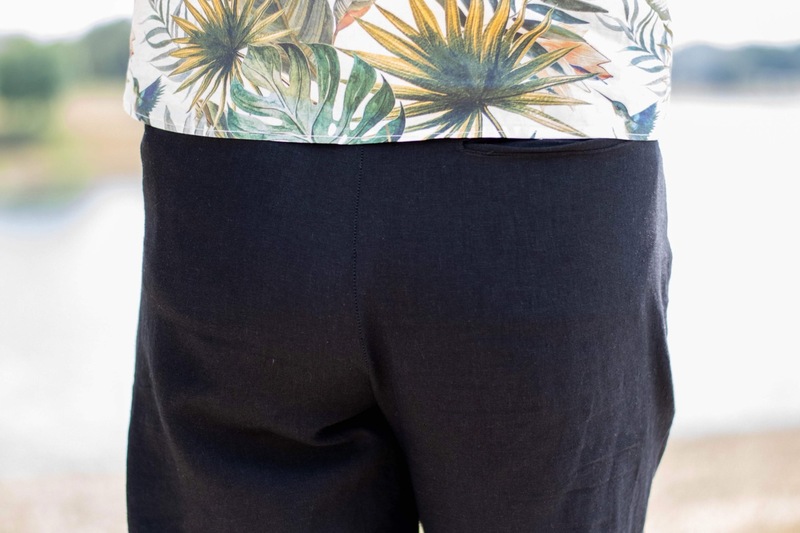 We were super excited to offer participants the choice of both the Lander Pants (and/)or the Forsythe Trousers this month, and I’ve loved seeing what everyone has made. From shorts to capris to full length pants, there are now quite a few of us who can say that we’ve actually made pants! And here’s a little backstory on mine. I fell in love with the Lander Pants as soon as they were released. The cool 70s vibe and the flattering high waist were both huge selling points for me. 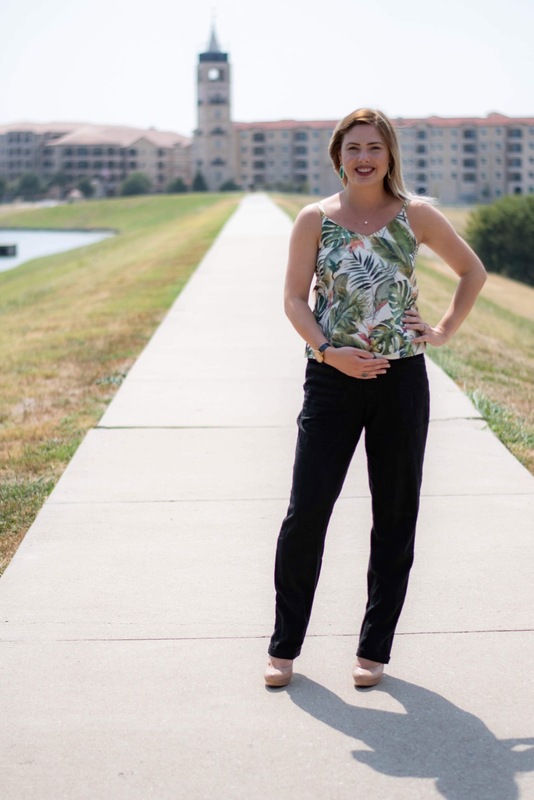 When we chose the Lander Pants as one of our July pattern options, I was over the moon, and dreamed up a pair of off-white full length pants and a pair of blush pink shorts. 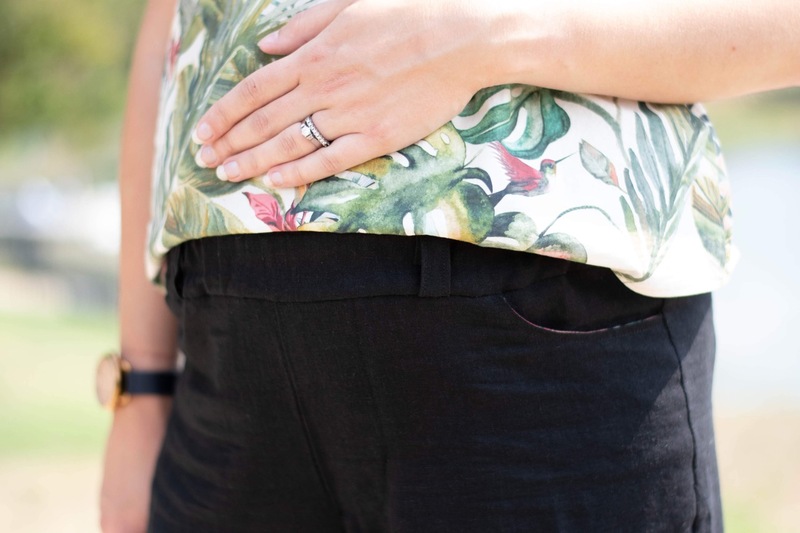 I found out that I was pregnant in February, but I continued to think up ways I would make the Lander Pants work for me – potential maternity hacks, yoga waistbands, etc. However, when July rolled around, and my belly was fully into the growing phase, I finally had to sit back and re-think my options here! I realized that in order to make the Landers maternity friendly, I was probably going to end up with a pair of pants that (though still awesome) would lose a lot of the features that I loved most about the design of the Landers. 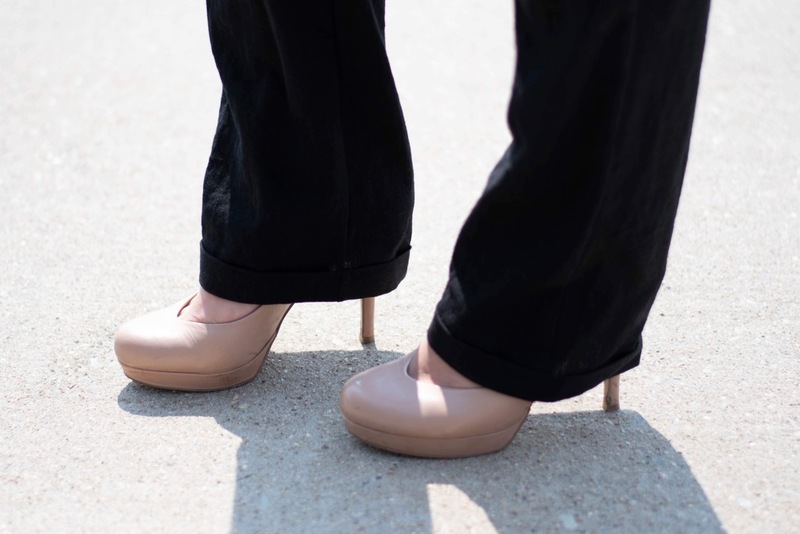 So I decided to take another look at the Forsythe Trousers, and decided that these were definitely the way to go! In deciding what I wanted to do with my pants, I wanted to consider ways to make them wearable now as well as in the future. I have been lovingly referring to myself as a rectangle person lately, as I watch my waist definition disappear and feel like I’m about the same width from my shoulders down to my ankles anymore! My belly grows bigger and bigger everyday, and both my hips and bust are larger than normal. All of this in consideration, I went ahead and measured my hips (ignoring my “waist” measurement) to choose my size. I still fall on the larger size of the measurements for the small, but I decided that since I am not at all done growing this baby, I’d go ahead and cut a straight size medium. Honestly, I think I may have been better off going with a small with a few alterations. I didn’t make ANY alterations to my pattern, in the end! I toyed around with the idea of foregoing the waistband and adding a knit yoga waistband, but in the end decided I would at least try out the regular elasticized waistband. My plan was that if this didn’t work out, I’d just seam rip it and go the yoga waistband route instead. So I added in the elasticized waistband, and it actually fit comfortably around my belly, so I left it! My thoughts are that the trousers fit now, though they might not be the most flattering, but will already be ready to go once my belly shrinks again! A little bit about the construction process here – I used the .pdf pattern and printed, trimmed, and cut at home. The pattern had a few extra lines printed on it which was a little confusing, but I was able to work around them and figure out the appropriate cut lines. From start to finish, the pants came together way more quickly and easily than I expected. I spent four nights / afternoons total, maybe about 2 hours each day, from assembling the pattern to final touches. I alternated between my sewing machine and my serger, which I found to be a great option as it finished my seams neatly and I didn’t have to worry about any fraying from the linen. The biggest challenge for me was the welt pockets – I’d never sewn welt pockets before, and I sewed them in completely wrong the first time around because I got confused about what was going on! Unpicking and re-sewing added a bit of unnecessary time to the table, but it was a good learning opportunity – I totally understand welt pockets now! These look super nice when well pressed, but I’m a little disappointed in how they looked in person when taking photos. I couldn’t get them to lay perfectly, and they look a little messy in my opinion! My favorite features on these trousers are the cuffs and front pockets. 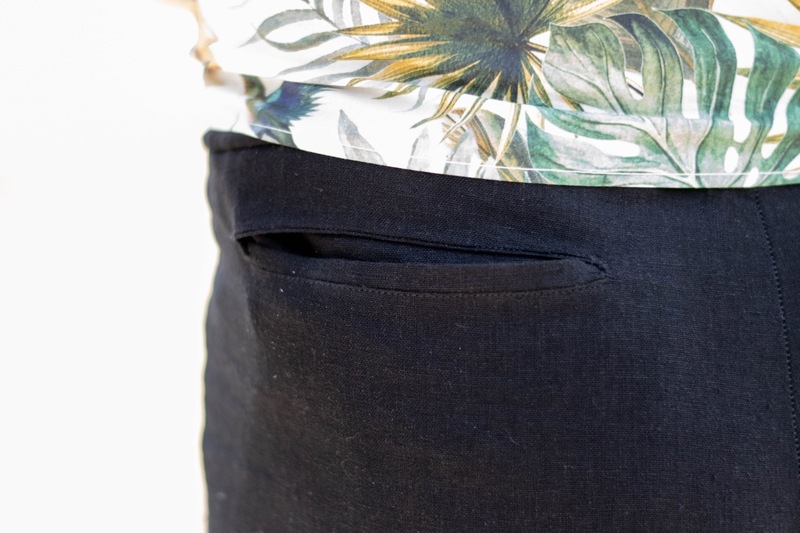 I used some leftover cotton lawn from my Kalle Shirt as the pocket facings, and I love that the tiniest bit peeks out at the pocket line. 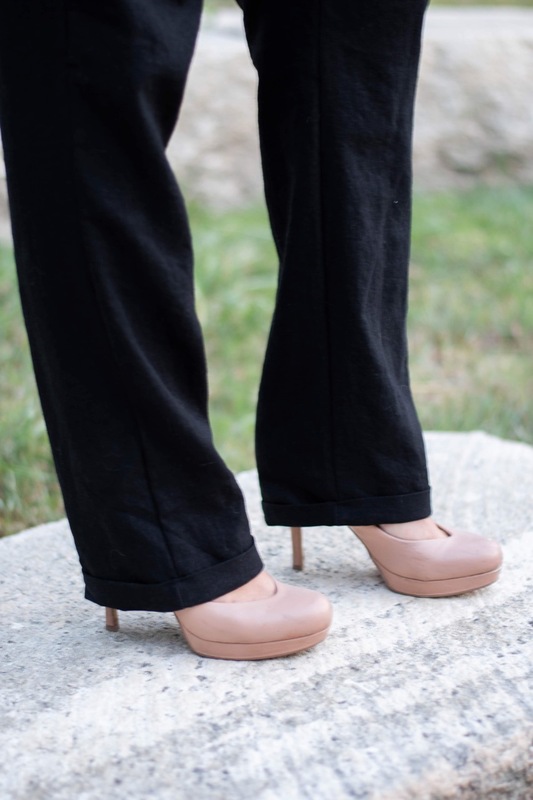 The cuffs give these pants a polished finish, and I think they look super great with heels! 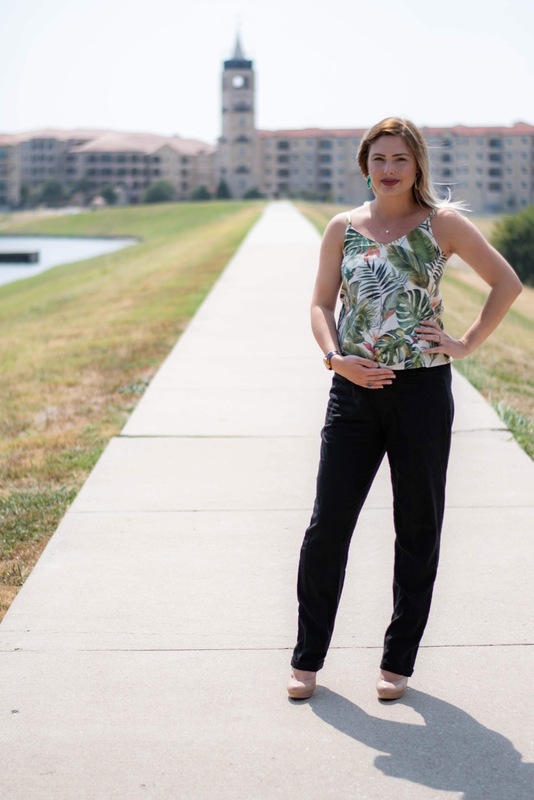 I am excited to have some pants that are both comfortable enough to wear around as casual, everyday pants, but also polished enough to wear to work or more professional events. As far as the fabric used for the trousers themselves, this is the lovely Brussels Washer linen/rayon blend in black from Cottoneer Fabrics. I have seen so many sewists raving about linen in the past year, but I have never worked with it myself. I don’t know why, but I could never wrap my mind around it being touted as a soft, breathable, comfortable fabric – in my head, it was scratchy and stiff. I don’t know what I was thinking! I LOVED working with this fabric, and it is, indeed, incredibly comfortable. I’ve already added another cut of linen to my stash for another (future) pair of pants! This linen blend is exactly what I’ve been hearing others go on about – it is so soft, and it breathes so well that black pants in triple digit Texas summer heat don’t even seem like a scary idea! It is opaque enough that I’m not worried about anything showing through, as well. I am sure that the rayon blend only makes it even more lovely – if you’re looking for some great linen to sew with, I’d highly recommend this stuff! So at the end of the day, am I in love with my Forsythe Trousers? Not yet. Do I feel like a million bucks in this outfit? Not really. I think that when I look more like myself, I’m going to be so happy with these. Right now, I just feel somewhat odd about the shape of the pants over my belly. 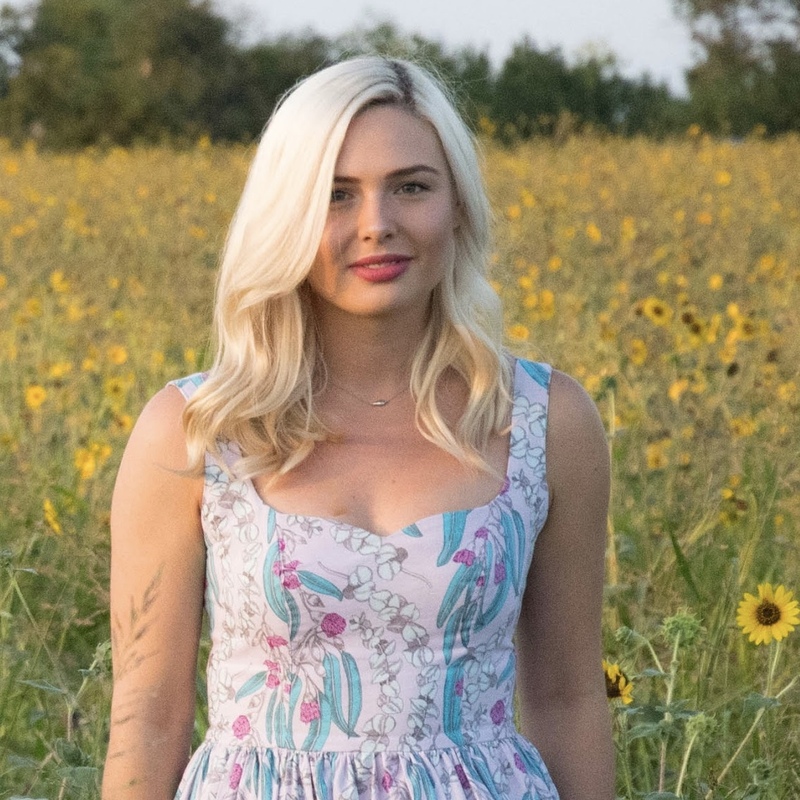 I think this entire outfit is going to be so cute next summer, but try as I might, I just didn’t feel that the trousers were very flattering or offered me any extra bit of confidence when I was wearing this for photos. I’m happy to have this pants option in my wardrobe now, but I can’t guarantee that I will be wearing them any time soon. The pants themselves are great, and I’m looking forward to loving them next year. In the meantime, at least I can feel super awesome about the fact that I made a great pair of PANTS! back view. not my favorite!